Below are instructions for how to disinfect and clean sponges, such as those you use in the kitchen daily. If you use your sponges to wash your dishes, pots and pans, as well for other cleaning tasks in your kitchen, such as wiping down kitchen counters, it is important that you clean and disinfect them regularly, because otherwise you're trying to clean a surface with something dirty. You'd never use a dirty rag to wash your dishes, so make sure you're not doing something similar with a dirty sponge. How Often Should You Clean Your Sponges? At a bare minimum you should clean and disinfect your sponges once a week using one of the methods listed below, but some do it even more frequently, sometimes nightly. I would personally lean toward doing it at least every 2-3 days. I would also do it anytime it begins to have a smell. Smells often indicate bacterial growth, so if you have a stinky sponge clean it! But whether it smells or not, your sponges should be cleaned regularly. 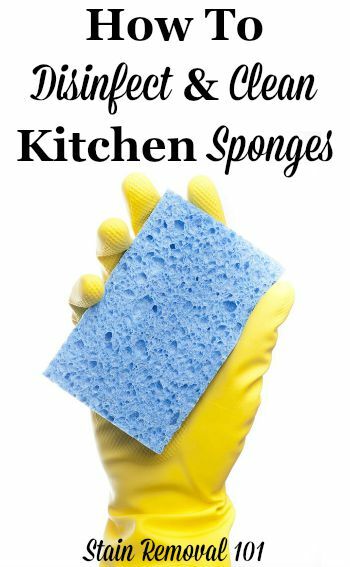 There are many ways to clean sponges, including the most popular methods which I've discussed in more depth below of using the microwave or your dishwasher. 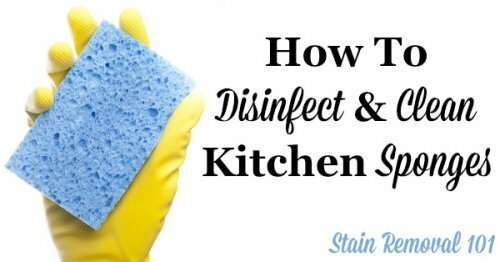 This is the method I personally use for cleaning my kitchen sponges. Place your sponge in the microwave, while damp, and heat it for 1-2 minutes. This heats the water inside the sponge to boiling, and the boiling water kills the bacteria and other yuckies in the sponge. For this method to work the sponge must be damp, not dry. If it is dry there is no water in the sponge to boil, plus you could start a fire in your microwave. Once the sponge has been heated in this manner you need to exercise caution when taking it out of the microwave because it will be scalding hot. I always let it cool again for a couple of minutes, just letting it sit right in the microwave, before I pick it back up. 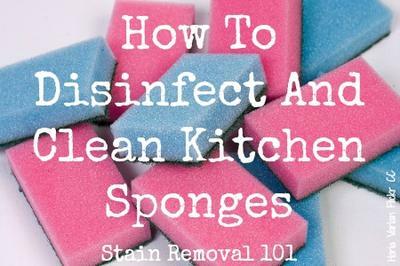 If you don't have a microwave another similar method for disinfecting your sponges is to put them in boiling water for a couple of minutes. Just make sure to somehow submerge the sponge, instead of it floating on top, so all surfaces of the sponge get superheated to kill germs. Below I've provided instructions for yet another method to clean sponges, using your dishwasher. Join in and write your own page! It's easy to do. How? Simply click here to return to kitchen cleaning hints. Another popular method for cleaning your kitchen sponges is to run them through the dishwasher. This works as long as the sponges can get hit with the jets of extremely hot water that your dishwasher uses to clean dishes. If your sponges are a bit smelly this is a simple method to clean them while cleaning the rest of your kitchen. 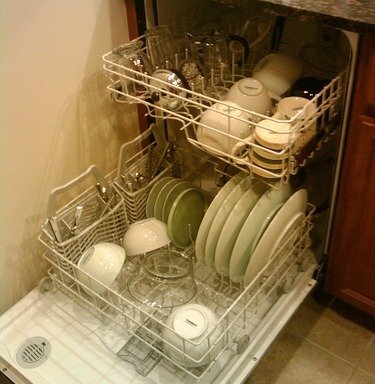 Just load your dishwasher like normal and put your sponges on the top rack and run like normal. Some people put the sponges down in the silverware tray when they use this method. It will work, again, as long as the spray jets for the dishwasher can hit the sponge consistently. But the lower rack of your machine is rougher on things than the top rack, and so it can beat up your sponge and make it not last as long from the extra wear and tear. That's another reason I personally prefer the microwave method. It doesn't physically cause as much wear and tear on the sponge, meaning it can last longer than the putting it in the dishwasher method. One reader, Lisa, shared specifically wrote in to tell me how she used this tip to stop her sponges from smelling when she was experiencing "Stinky Sponge Syndrome" caused by Dawn dish soap. Lisa said: "Dawn made my sponges and dish rags stink as well. I didn't even think it could be the soap until I stumbled onto this website! I will be changing to something more eco-friendly I think. But what I was doing to get rid of the smell was to toss the sponges in the dishwasher every other time I ran a load...Bad smell gone!" If you don't know what we're talking about with stinky sponges caused by certain dish soaps, check out all the readers who've experienced Dawn dish soap causing smelly sponges and dishcloths here. What About Washing Sponges In The Washing Machine? ***Update: After publishing this tip about using your dishwasher for cleaning your sponges I got comments from several readers who instead of tossing them in the dishwasher throw them in the washing machine. You can read their ideas in the comments for yet another method for cleaning your sponges. So how do you clean this common kitchen item? I'd love to hear so tell me in the comments below. You can also read reviews of kitchen and cleaning sponges here to find a brand that will work well for you. I use a new dish rag every time I do dishes. Never use the same one more than a few hours. I bleach them with the whites. I throw my sponge and scrub brush in the dishwasher every time I run it. I also change my sponge every couple of weeks. You can also put in washing machine and dryer. I soak mine in vinegar and water for an hour. I never use the same one over 2 weeks. I get the reusable bamboo fiber sponges and run them through the dishwasher. Or I run them through the washer and squeeze out any excess water out of them on a put them on a rack to dry completely before storing. I spray mine every night before I go to bed with bleach (i.e. Fantastic WITH bleach) and an extra spray afterwards if I'm washing anything that had raw meat on it. Doing this for 17 years. I used to use these nice microfiber ones that I bought from Walmart and tossed them in the laundry. Problem with those was that they didn't stay "springy" for long and the cotton inside would flatten down. I just use cloths now. I rarely use sponges, if I do, it's a special cleaning job. I don't trust them to get thoroughly sanitized. I use cheap washcloths from the dollar store 99% of the time. Just use them, then drop in a bucket of bleach water until I've filled it and then I pop them in with my white towels load. When they get too gunky I toss em. When those won't scrub something off I'll turn to either SOS pads or a cheap scrubbie brush (that I replace after I've used it enough that the thought of using it again even after I've put it through bleach or the dishwasher makes me cringe). Also you can put a little bleach, dishwashing soap, and water in the sink and soak them overnight. I never put rags or sponges in dishwasher again. Tore MINE up this way. They tear up and get in motor. At least mine did. Clogged up pump and tore up. Technicians will tell you this is not advisable. I own a cleaning service and we wash all of ours with Pinesol or bleach in the washing machine. Each time I use a sponge (unless it is new from a package) I put it in the microwave (wet) for 1 minute on high. I've read that the dishwasher doesn't clean/sanitize sufficiently unless it is allowed to dry completely out afterwards. With the microwave you don't need to worry about that. If one has no microwave, sponges or rags may be boiled in a pot for a few minutes. To get my sponges "clean looking" as well as sanitized I use the Awesome brand equivalent of OxiClean. It cost about $1 at Dollar Tree and comes in an orange scent that smells really good. I put about 1/2-3/4 scoop and 4-6 cups of boiling water in the sink with the sponge and soak it for a few minutes. It gets any stains out and looks almost new and it's clean. I was wondering if you knew if it's effective to wash your sponges in the washer with a load of towels and then drying them in the dryer? I throw mine in with the laundry that includes hot water and bleach. I stopped putting them in the dryer. You can use the microwave but I prefer the dishwasher. Place them in with your load of dishes. Your pot scrubbers and all your sponges come out clean. The water and the detergent will clean them. I have quit buying the large boxes of detergent. I make my own and now place my sponge in to my bowl of homemade concoction. Works better on my laundry. I never run out. I thought 2 minutes too, not just one. I do this regularly, but I originally read that you should put it in for two minutes. I add a drop of essential oil or a 1/4t of extract to the damp sponge so that when I microwave it everything smells good. I've used peppermint, lavender, almond and tea tree. While I do microwave my sponges on a regular basis, they sometimes get a 'funky' smell. I pop mine in the silverware basket in the dishwasher every so often. They come out feeling fresh, and I would swear they don't wear out as quickly! About once a week I toss my sponge into the dishwasher with a load of dirty dishes and let it go through the wash. The reason the dishwasher and microwave methods work is because they get hot enough to sterilize the sponge. You don't usually need to sterilize your clothes so even on the hottest setting, the water will only be as hot as the temperature your water heater is set to. Bleach will destroy a sponge very quickly. I have used the dishwasher method for years! When the sponge gets to the point that it doesn't look clean when I take it out of the DW, I stick it with my housecleaning supplies and use it for bathtubs, floors, etc. I haven't tried the microwave method yet but will. Well, maybe I'm old school or old fashioned but I still use HOT water and dish soap and rub and rinse repeat and squeeze until mostly dry after a day of using it. If I forget and it seems a little smelly, just do it then and it takes care of it. If you put a lid on your pot of boiling water, it won't matter that the sponge is floating. The steam is consistently as hot as the bubbles popping around your sponge. It will get disinfected just fine! I've cleaned sponges using both the dishwasher and washing machine. I only launder towels once a week, and dishwasher two or three times. Think I will try the microwave method, less time and easy to clean more frequently.